RC power sockets commonly use the 433 MHz band, like many other Short Range Devices (e.g. car keys, garage doors, LPD radios). 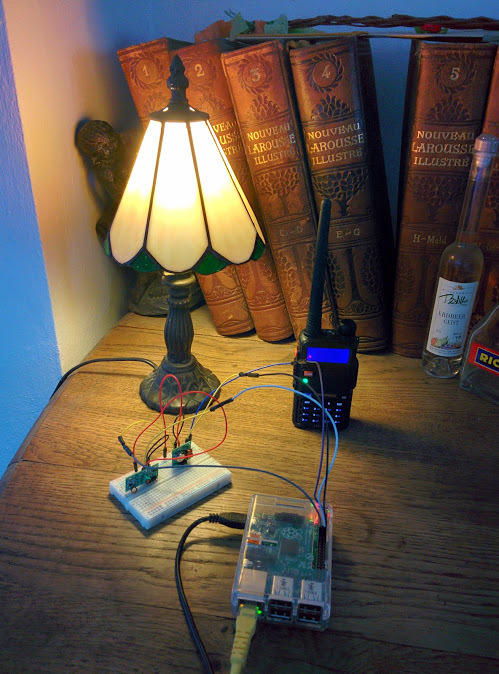 We will use pilight to sniff the RF signals so we can reproduce them and send them from the Raspberry Pi, in order to switch a lamp on and off. I also tried this with the Mumbi m-FS300, but without success. The reason for this is that the mode of operation and the protol have changed recently for these sockets, whereas the type number (m-FS300) has not. They don’t have DIP switches anymore, for instance. The transmitter and the receiver operate on 5 V. However, the receiver passes this voltage to its data pin. So better connect its VCC pin to the 3V3 pin on the Raspberry Pi. 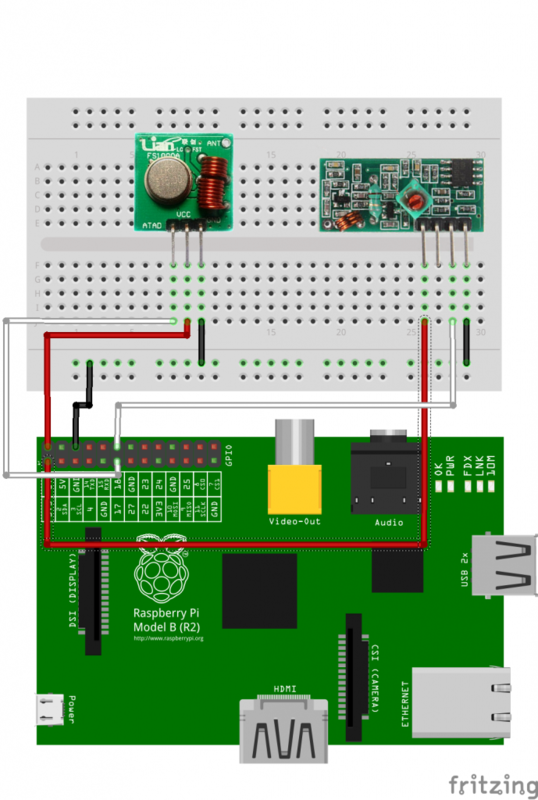 Connect one of its DATA pins to pin 12 on the Raspberry Pi. Connect the transmitter DATA pin to pin 11 on the Raspberry Pi. Physical pins 11 and 12 correspond to BCM GPIO 17 and 18, as well as to wiringPi pin numbers 0 and 1. Refer to the manual of your sockets here. On the remote control of the Brennenstuhl a five digit number is set with a five channel DIP switch. Mine is set to 12345. The sockets contain a nine channel dipswitch. The first five are set to the five digit code number. The other four correspond to the A, B, V and D on/off buttons on the remote control. I use the D button here, so I have this DIP setting: 111110001. You’ll be presented a list of configuration options, including all supoorted protocols. If you’re unsure, simply select them all. These should correspond to the wiringPi pins 0 and 1 mentioned above. Now hold the remote control close to the receiver and press one of its button. I got a lot of rubbish, probably due to the receiver’s poor quality, but one of the JSON objects looked like a plausible response. I pressed ‘D Off’. This turned out to be the correct guess. Now integrate this with your shell script, python program, web service or whatever suits your needs. Theme Designed by InkHive. © 2019 Pygmalion. All Rights Reserved.